Hot hot hot! This is another spicy tuna roll, but it gets it’s heat from a completely different source. 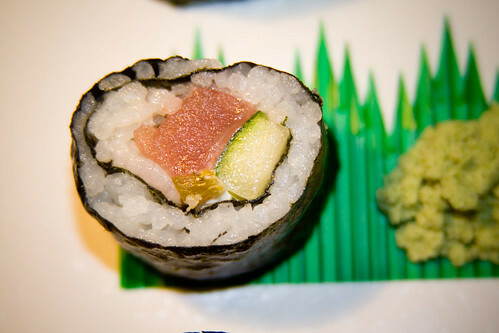 Instead of the Sriracha sauce that is in normal spicy tuna rolls, this one has a jalapeno as one of it’s fillings. Even though it has cream cheese to soothe your taste buds… it really doesn’t help much. Or so I hear. To be honest, I made Son try this one, and I didn’t even have a bite! If I had, I guarantee I would have been running around the kitchen with tears running down my face. 😀 Those of you who are like me and not huge spicy fans… yeah you, you know who you are!… this one isn’t for you. However the rest of you who adore spicy foods… yes I know you know who you are too!… you will love this! Slice jalapeños… but be careful! Don’t get the oils in your eyes! Discard the stem. 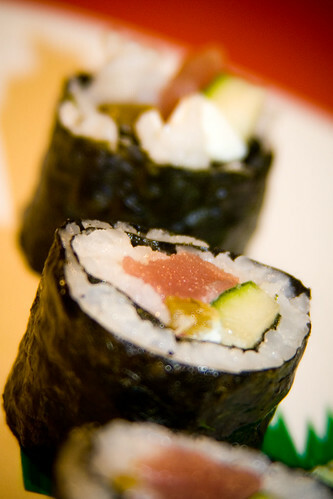 Roll the sushi, using a few sticks of cucumber, some cream cheese, a sliced jalepeño and some tuna as your fillings. I love sushi and have been trying to make it at home. Thank you for the recipe I am going to have to give this a try and see if I can handle the heat! When I use jalapeÃƒÂ±os in my rolls I fry them up first. This will soften the heat of the jalapeÃƒÂ±os quite a bit and brings out more of the natural flavor of the jalapeÃƒÂ±os then just straight heat. Oh and usually just because Salmon near me is much cheaper I’ve done this roll with Salmon in place of Tuna. Just as good. Sorry to spam your blog … ok I am not that sorry. I noticed your nutrition info seems really high … especially in the Sodium department … are you factoring in the soy sauce as well into the roll? If not, what makes the sodium so high? Ralph – Hehe yeah, I know. How do you fry them? Like… tempura fry? Or just stick a raw jalapeño in hot oil and fry it? Yep salmon sounds yummy too! As for the nutrition facts… you get about 500 mg of sodium from the sumeshi, and then you get about 300 something mg of sodium from one jalapeño (I assumed there would be the equivalent of one jalapeño in each roll). Plus small amounts of sodium from each of the other ingredients. Yeah just some butter or something in a pan and pan fry it. Like as if you were to caramelize an onion. 300 mg for a jalapeÃƒÂ±o? You said you had jarred jalapeÃƒÂ±o’s that got to be from the processing…I can’t imaging a raw jalapeÃƒÂ±o having that much sodium. 🙁 I buy a jar of sliced jalapeño peppers from Albertson’s… I believe it is the Albertson’s brand. I find them to be very spicy, but I’m also not super tolerant of spicy foods, so maybe they’re not quite as spicy as I thought they were? I know you’re looking at me 😉 It still sounds yummy. I’m eating spicy foods lately a bit! See the egg sandwich on my bento site? I actually wound up pouring Red Devil on that to give it a kick because it was boring and I couldn’t find ketchup (moving made me lose ketchup? and mayo? I dunno why…) Oh, and Red Devil isn’t straight spicy, it’s vinegary, like ketchup, so I like putting it on stuff when I want a nice vinergary kick. Like have you ever had Cantonese style chow mein? I put red vinegar on that usually and sometimes when I want a kick, I put Red Devil instead… sooo good! Here’s a great dish that I put together in 20 minutes. wickedly tasty as well. I think you’re gonna like it! Fry the onions until medium to dark brown. Add peppers and stir-fry on high heat for 5 minutes. Fork in your Tuna and mix well. Add tinned tomatoes and tomato puree. and lemon juice and stir well. Reduce heat and simmer for about 10 to 15 minutes once it’s boiling. Dish up on a bed of rice. This meal serve four good helpings! I kid you not, this is a very tasty and yet cheap meal. You’ll love – I bet you! Anthony, that looks delicious! Thanks for the recipe! I won’t say how I ended up here(on this page,it kinda akward :))… But I have been looking all over your site and now I want to make sushi so bad! Unfortunately, I can’t find any nori (I’ve been searching like a mad man,my country is kind of small…and boring, and really low on things like japanese food!). Do you have any replacements for nori? I heard of someone that used the skin of a cucumber but I think it will be very hard to roll? Any ideas what I should use instead of nori?